A significant number of families have pets and they need to be ready for a disaster too. Below are items to have ready to go in your pet emergency kit. Remember to have enough supplies for each of your pets. Most importantly each cat or dog needs their own crate or vari kennel. Dog or cat food, dry or canned-one to two week supply. Can opener, spoon, dish. Water—one to two week supply (include water purification tablets). Collapsible bowl that is easy to store. Cleaning supplies to clean crate. Vaccination records/medical history/picture of your pet & any medical condition(s) (Store in waterproof container). Medication, list each pet separately include dosage/frequency; include flea, tick and heartworm preventatives. Name of your veterinarian, address, phone number. Include release form authorizing medical treatment for your pet. Include any pet insurance information, policy number, contact (store in waterproof container). Pet Information, include copies of registration information, adoption papers, proof of purchase, microchip, tattoo or other identification information (store in waterproof container). List of emergency contacts (store in waterproof container). Thermal blanket—should be reusable, wind and waterproof. Needs to retain 90% of body heat. Emergency light sticks with lanyards. Sanitation/poop bags, cat litter, to maintain sanitation in temporary shelter area. Toys—for entertainment during a time of great stress. Rope—50’ of vinyl cord to create runner or tie down. Gives pets freedom to roam while keeping them close. 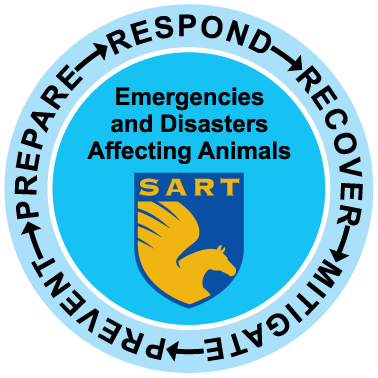 Decal—emergency pet alert sticker to put on door/window. Informs rescuers you have pets inside. Waterproof container to store pet emergency survival kit. Dog crate or cat carrier. This is for a basic pet first-aid kit. For convenience, you may want to make one for your home and another for your car. It is also suitable for a disaster preparedness kit. Place the contents in a plastic storage box, tackle box or coffee can with lid. Pre-made pet first-aid kits are available for purchase at pet supply stores, pharmacies, retail and discount stores and online.